Police Chief Leon Krolikowski met a group of New Canaan, Conn., residents for pizza and an informal discussion Tuesday, Oct. 14, 2014. 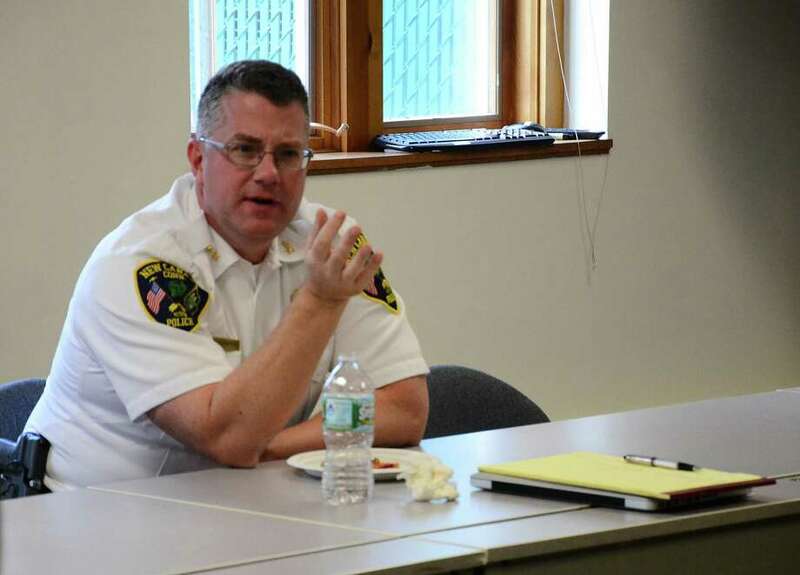 Heroin, domestic violence and pedestrian safety in town were some of the topics Police Chief Leon Krolikowski tackled during an informal discussion with New Canaan residents Tuesday. Other unexpected subjects, such as the Ebola outbreak, Paul Simon and police officer body cameras, also arose during the session, as the public joined town officials and police personnel at police headquarters for another "Pizza with the Chief." Even though heroin has not made headlines in New Canaan, Krolikowski said he is concerned with its growing use in the community. "We've seen somewhat of an increase in heroin use in town and it's more prevalent than it's ever been," he said. The mother of a New Canaan High School student in attendance said she's heard other parents express concern about children being exposed to heroin at the school. Krolikowski said there's "no question" some local high school students have used heroin, but he would not consider having an undercover officer investigate the issue there, as the woman suggested, because "there's no precedent for that." "I don't think it's prevalent or widespread," he said. "The hard part for us to investigate cases like that (is that) we need someone to inform us." Heroin, however, is not the only drug problem in town, according to Krolikowski. "Every kind of drug you can imagine is in New Canaan and has been in New Canaan for years and years and years ... from crack to acid to heroin, everything." Capt. Vince DeMaio said another huge problem with abuse of the prescription pain killer, oxycodone. To fight the spread of all illegal drugs in town, Krolikowski said the force soon would start administering overdose antidotes when responding to drug-related emergencies. Besides DeMaio, joining the chief Tuesday were Capt. John DiFederico, Police Commissioner Stuart Sawabini and Jim Cole, former chairman of the Police Commission. Although Ebola wasn't a major topic of discussion, the chief said he's asked officers to be careful when responding to medical emergencies, especially because "we're usually the first person on the scene." "Really, we're going to have to make the decision if there's a probability that the person has been exposed, because we don't have the proper protective equipment for people to handle that," DeMaio said. Besides drugs, Krolikowski said New Canaan's other "dirty little secret" is domestic violence. "We're seeing a big surge in it, more so than ever," he said. This year, according to the chief, there have been about 65 domestic violence incidents in New Canaan. He noted, however, that increased awareness might be contributing to the number of incidents being reported to police. Krolikowski expressed disappointment with the way state Superior Court in Norwalk recently handled the case of a famous New Canaan couple arrested in April after a domestic dispute. Paul Simon and Edie Brickell were charged with disorderly conduct following the dispute at their home, but neither was issued a protective order and the charges were dropped within two months. The chief said the case "was disposed of very quickly" and that he has no doubt the charges were dropped because of the pair's celebrity status. He added that he's been asking lawmakers to make it mandatory for judges to issue a protective order for all domestic violence arrests, even if just for a few days. When it comes to police technology, the chief said the department will begin using its first license plate reader this month and is looking into purchasing body cameras for officers. Sparked by the recent case in Ferguson, Mo. -- where an unarmed black man was killed by a white police officer -- several police departments in the region, like others nationwide, are considering the use of body cameras. Westport police recently announced they plan to buy as many as 15 of the devices for its officers. The last issue discussed Tuesday was pedestrian safety. On Oct. 6, a New Canaan High School student was hit by a car on his way to school. That was at least the fourth pedestrian accident on a New Canaan road this year. One in June was fatal, when town employee died after he was struck by a car on New Norwalk Road. The chief said the town's Traffic Calming group is investigating areas where pedestrian-safety enforcement needs to be strengthened, but he added individuals should use common sense and act as though every driver could potentially fail to grant the right-of-way. In the last incident, according to police, the teen's mother dropped him off in the center lane of a two-way traffic section of Farm Road, and the 14-year-old did not use a crosswalk as he headed to the school's sidewalk. "We do our best, certainly, to enforce traffic laws," Krolikowski said. "We can't be everywhere all the time, so it's got to go back to the individual to be smart and defensive, whether they're driving, or walking or biking."